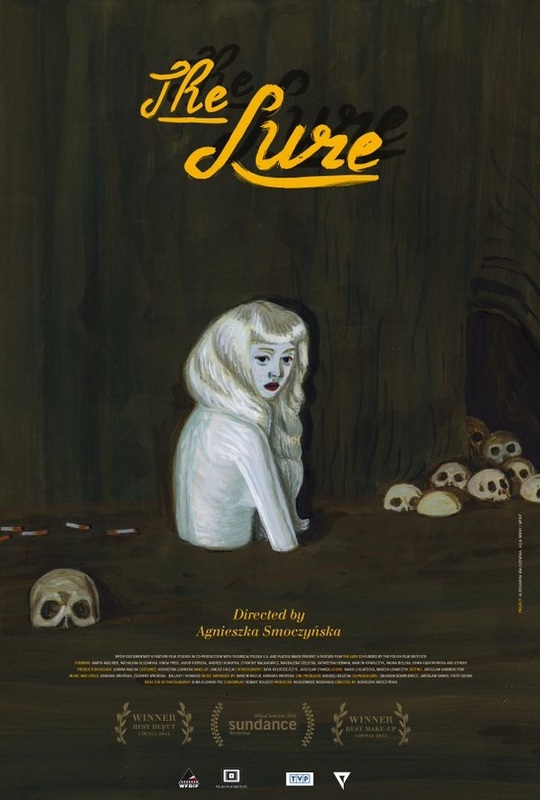 I really wanted to love “The Lure”, but after a very promising and really strong start, it increasingly lost focus, losing itself in irrelevant minor characters, sub-plots that don’t go anywhere, and a couple of scenes that felt totally superfluous and pointless to me. Furthermore, the musical numbers seemed to get completely out of hand (and increasingly didn’t meet my personal musical taste, even though that’s highly subjective, of course) and slowly but surely started to annoy me. The ending itself once again was great, really gripping and quite emotional, but by the time we finally got there, “The Lure” already had lost much of its appeal. One of my favorite scenes of the movie was the beginning at the beach, when the mermaids show themselves for the first time, and enchant the (male) musicians playing there with their siren call. I also liked how they got sucked into performing in a seedy night club. The two young actresses who play the mermaids, Marta Mazurek and Michalina Olzanska, were absolutely great, giving very natural, convincing and expressive performances. It also helps that they are absolutely gorgeous, and thus extremely beautiful to look at (with Michalina especially drawing my eyes to her, thanks to her incredible seductiveness). I also quite liked the first couple of musical numbers, as well as the overall story. How Golden slowly falls in love with this boy, finally deciding to give up her life in the sea, and everything that happens afterwards. After a muddled middle part, that (finally) managed to grip me again. And even though it’s totally bonkers (and, obviously, scientifically impossible), I also quite liked the way the transformation from mermaid to woman works here. That really was a fascinating idea. Talking about fascinating: How they portrayed the tails of the mermaids also was quite interesting. Unfortunately, as mentioned before, “The Lure” got increasingly frustrating in the middle. There were many scenes and musical numbers that felt completely unnecessary to me, like the “poison”-song. I just didn’t get what was going on there, and why it was supposed to be important. There were also all those subplots with minor characters, like the policewoman, or the merman, which never amounted to anything. They are gone as suddenly as they appeared, never really adding anything to the movie. I also thought that they overdid the musical numbers, but that may also be due to the fact that some of the later ones weren’t really my cup of tea, music-wise. Overall, I think the movie would have been a lot better if they would have cut all that superfluous stuff from the middle, and used that running time to deepen a couple of relationships and developments. As it stands, however, “The Lure” felt increasingly jarring, erratic, aimless and even annoying to me – and thus, after a very strong beginning, got less and less alluring. This entry was posted in /slash, cinema 2016, movie reviews, new releases and tagged /slash, /slash 2016, Agnieszka Smoczynska, Córki dancingu, drama, horror, Marta Mazurek, Michalina Olszanska, musical, Poland, Robert Bolesto, romance, The Lure. Bookmark the permalink.